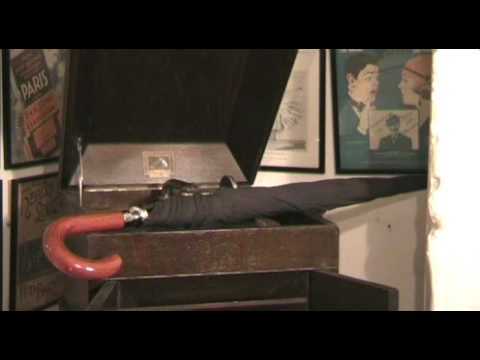 “Umbrella Man.” Words and music by James Cavanaugh, Larry Stock, and Vincent Rose (1938). Recorded by Elsie Carlisle with orchestral accompaniment on February 1, 1939. HMV BD 661. “Umbrella Man” is a slow waltz whose lyrics describe a tinker who specializes in umbrella repair. When work is slow, he will fix other commonplace things, such as socks, clocks, and the occasional broken heart. How he accomplishes the latter is not explained; it is a mere assertion. Elsie Carlisle lends sincerity to this simple song with her imitation of the umbrella man’s intoned value proposition (“Um-BRELL-as!… Any umb-er-ellas to fix today?”). The best selling [sic] song in the country today is “The Umbrella Man,” which owes a part of its popularity to British Prime Minister Chamberlain’s omnipresent umbrella… [D]ozens of cartoonists have used the song title as a text in describing the British statesman… Like many hits, no one wanted to publish it at first and it seemed destined for a pigeonhole until a bandleader got wind of it. Now “The Umbrella Man,” thanks to Neville Chamberlain, will yield its authors about $10,000 per man. “Umbrella Man” was recorded in America in 1938-1939 by Kay Kyser and His Orchestra (with vocals by Harry Babbitt and Ginny Simms), Johnny Messner and His Orchestra (vocals by The Three Jacks), Swing and Sway with Sammy Kaye, Connee Boswell (accompanied by Woody Herman and His Orchestra), and the Benny Goodman Quintet. In Britain it was recorded by Nat Gonella and His Georgians (v. Nat Gonella), Ambrose and His Orchestra (with vocals by Denny Dennis), Joe Loss and His Band (with vocalist Chick Henderson), Billy Cotton and His Band (with Alan Breeze, Jack Hylton and His Orchestra (with vocalist Sam Browne), Billy Thorburn’s The Organ, The Dance Band and Me (with vocals by George Barclay), Mantovani and His Orchestra (with Jack Plant), Josephine Bradley and Her Ballroom Orchestra (with Pat O’Regan singing), Harry Roy and His Orchestra (v. Harry Roy), Victor Silvester and His Ballroom Orchestra, and Maxwell Stewart’s Ballroom Melody. A notable version not done by a dance band is that of music hall comedians Flanagan and Allen. “Pardon Me, Pretty Baby.” Words by Ray Klages and Jack Meskill, music by Vincent Rose. Recorded by Elsie Carlisle under the musical direction of Jay Wilbur c. August 1, 1931. Imperial 2532. 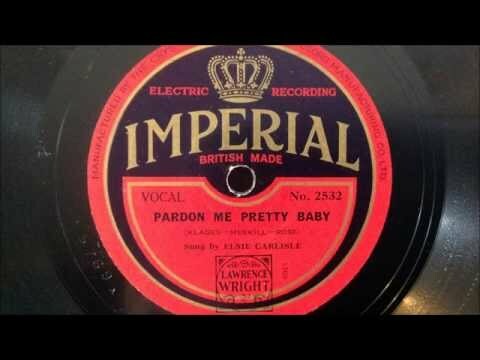 Elsie Carlisle recorded this version of the popular “Pardon Me, Pretty Baby” for the Imperial label in August 1931 under the musical direction of Jay Wilbur. It is a light song with a chatty patter representing a persistent but inept attempt at a pickup. The tune is catchy, but a trifle repetitive. Elsie makes the song exciting by alternating between playful singing and exaggerated conversational interjections, a technique which reminds one that she was a veteran of musical theater. In 1931 there were many treatments of “Pardon Me, Pretty Baby” on both sides of the Atlantic. In America, they include those of Joe Venuti’s Blue Four, Rudy Vallée and His Connecticut Yankees, Fred Rich and His Orchestra, Benny Goodman, Frank Novak’s Collegians, Ben Bernie and His Orchestra, “Whispering” Jack Smith, Sam Lanin’s Ipana Troubadours, and Gus Arnheim’s Cocoanut Grove Orchestra. The song was equally popular in Britain, with versions by Jack Payne (with a vocal trio including Billy Scott-Coomber), Ambrose (with two takes on June 19, 1931 — both with Sam Browne as vocalist — one take as Ambrose and His Orchestra and the other as the Blue Lyres), Jack Harris and His Grosvenor House Band (vocalist Harry Bentley), Maurice Winnick and His Band (“Topical Tunes,” with Al Bowlly on the vocals), the Arcadians Dance Orchestra (Bert and John Firman, with a vocal trio including Maurice Elwin), Harry Hudson (Sam Browne, vocalist), the Rhythmic Eight, Eddie Gross-Bart and His Café Anglais Band, Arthur Lally (credited as Al Dollar and His Ten Cents, with Sam Browne as vocalist), Jan Ralfini and His Band (with Tom Barratt as vocalist), Harry Bidgood’s Broadcasters (Tom Barrat, vocalist), Jay Wilbur and His Band (as the Radio Syncopators, with Les Allen singing), and Howard Godfrey’s Aldwych Players (also with Les Allen as vocalist). Betty Warren was notable in her live renditions of the song in Lawrence Wright’s Blackpool North Pier production “On with the Show” (1931). The composer of “Pardon Me, Pretty Baby,” Vincent Rose, also wrote “Umbrella Man,” which Elsie Carlisle recorded in 1939.